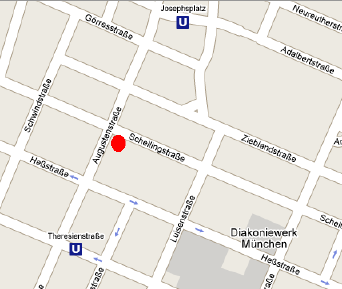 Take the U2 to Theresienstr, then walk two blocks north on Augustenstr. Take the U3 or U6 to Universität. Transfer to Bus 153 or 154 along Schellingstr. to Augustenstr. or simply walk seven blocks west on Schellingstr. Take Bus 154 to Augustenstr. Take Bus 54 to Giselastr. (or walk four blocks south on Leopoldstr.). Switch to Bus 154 to Augustenstr. Take Tram 12 or Bus 53 to Hohenzollernplatz. Switch to U2 to Josephsplatz. Walk 2 blocks south on Augustenstr. to Schellingstr. Or take Tram 12 or Bus 53 to Nordbad (see above).